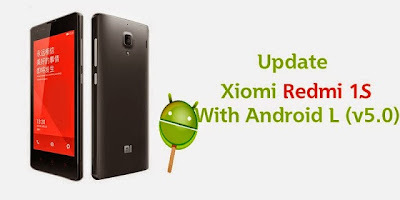 Download Xiaomi Redmi 1 S/MI3 Android L_(LoLiPoP) Update. Home » Android » Download » Xiaomi » Download Xiaomi Redmi 1 S/MI3 Android L_(LoLiPoP) Update. Xiaomi is the well known company in Asian countries.It a official company from china and provides high end Android smart phone for amazing price.That is the one of the reason behind companies quick success. Recently Xiaomi had launched two smartphone one is Redmi 1S and MI3 with price 6K and 12K respectively.But now Mi3 is no longer to be available. By default Redmi 1s and MI3 comes with android 4.3, An OTA updates are realizing some interval of months. Android V4.4.4 is not officially available but another non official CyanogenMod base custom rom is available for both smartphone, and it will solve the major problems like heating and RAM. Android L for Xiaomi Redmi 1S and Mi3 will get Android L V5 update in 2015.Currently Android 4.3 and 4.4 under development so that V5.0 L is available in starting of 2015. Indeed there is no any official update received for redmi 1s. As Hugo Barra stated android L will be out soon. But almost till end of the year no major ROM update has been released, except minor bug fixing updates. But if you already unlocked your bootloader then Android L ROM possible to install. However v5.0 is not officially build. It is based on Cynogen mode [cm11] and better known as "Mokee rom". Mokee rom is based on Cynogen mod. However kernel used in this rom is based on CM11. Its basically Android 5.0.1 version released by custom rom developer.